Integrated LED deck light features an easy-access face plate. Professional grade quality along with our lifetime warranty ensure this beautiful fixture will last a lifetime. Integrated LED. 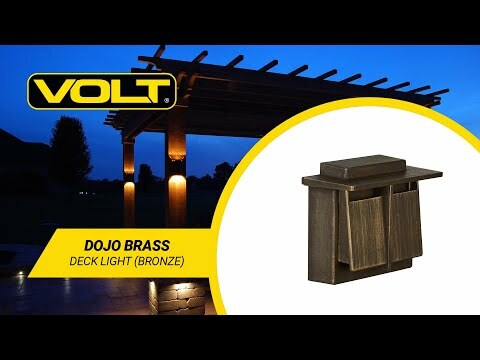 New daytime aesthetic appeal unmatched by other deck style hardscape lights. Unique backplate shape for wire tension relief to decrease the risk of the wires being pulled loose from the fixture. Easy-access faceplate makes the Dojo easy to install, requiring only a quarter turn to lock securely into place. 4' UL certified 18AWG, SPT-2 premium tinned copper lead wire. Dimensions Entire Fixture: 3.5" x 3" x 1.75"